effectively as looking through a telescope she/he built herself/himself. 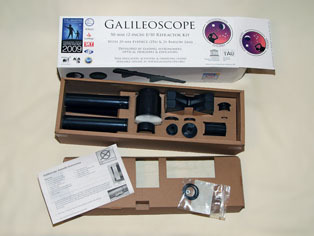 For IYA2009, we have developed a high-quality, low-cost, easy-to-assemble refractor kit. This 50-mm-aperture, 25- to 50-power Galileoscope can enable anyone to see the celestial wonders that Galileo first glimpsed 400 years ago and that still delight stargazers today, including lunar mountains and craters, Jupiter's moons, the phases of Venus and Saturn's rings. 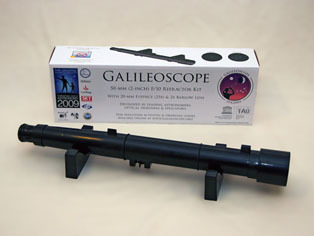 The Galileoscope incorporates features such as achromatic optics, stray-light rejection and a 1.25-inch focuser normally found only on more expensive telescopes. Accompanying the kit are curriculum materials based on active enquiry, cooperative learning, testing of ideas and predictions, and hands-on experimentation. Thus the Galileoscope gives students a pleasurable experience at the eyepiece and increases their understanding and sense of wonder at light, optics, and astronomy. As of May 2009, 60 000 Galileoscopes have been produced, 4000 of which will be donated to organisations and schools in developing countries, in collaboration with the Developing Astronomy Globally Cornerstone project. Sharing observations through the Galileoscope with as many people as possible, and encouraging parents, teachers, students, and others to think about their importance, supports one of the main goals of IYA2009: to promote widespread access to new knowledge and observing experiences.